Apple is reportedly planning to expand its 2015 iPhone lineup to include a new 4-inch model, according to Asian sources [Google Translate] cited by G for Games. The smaller form factor would bring back the ease of one-hand usage that was lost when Apple introduced its larger iPhone 6 and iPhone 6 Plus handsets. The supply chain sources suggest the new phone may debut in the second half 2015 with female users as the targeted audience for the smaller phone. Even without a new 4-inch model, Apple's history of product lineups suggests the 4-inch iPhone 5s would remain in the lineup in 2015 as the low-end offering once the current models slide down and the iPhone 5c is presumably discontinued. But if Apple wants to maintain a 4-inch option beyond the 2015 lineup, it would make sense to invest in an updated version of that size as the iPhone 5s ages. Still, the sourcing on today's rumor is not entirely clear and a track record is unknown, so it is difficult to assess the potential validity of the claim. As a result, we would not put too much stock in it for the time being until or unless additional information surfaces in the coming months. Even without a new 4-inch model this year, iPhone sales have been strong for the new 4.7-inch iPhone 6 and the 5.5-inch iPhone 6 Plus, with Apple setting a new sales record in the first weekend of availability. While the iPhone 6 is outselling the 6 Plus, the larger handset is holding its own in the phablet market, accounting for 41 percent of large-screened smartphone sales in the past three months. If true it would sell too! Many people want a smaller iPhone with better internals. I really don't see why they wouldn't. The 4" size did well for it's time. Anecdotally, I know many people that are still on their 4/4S because the current phones are too big. There is still a market as long as Apple doesn't handicap it in some way. Anecdotally, I know many people that are still on their 4/4S because the current phones are too big. This is about as likely as Apple making a 5.5 inch phone. iPhone S - Small, 4"
iPhone M - Medium, 4.7"
iPhone L - Large, 5.5"
iPad S - Small, 7.9"
iPad M - Medium, 9.7"
iPad L - Large, 12.2"
Then anyone can choose a size. Just so long as they don't skimp on the features in each model. 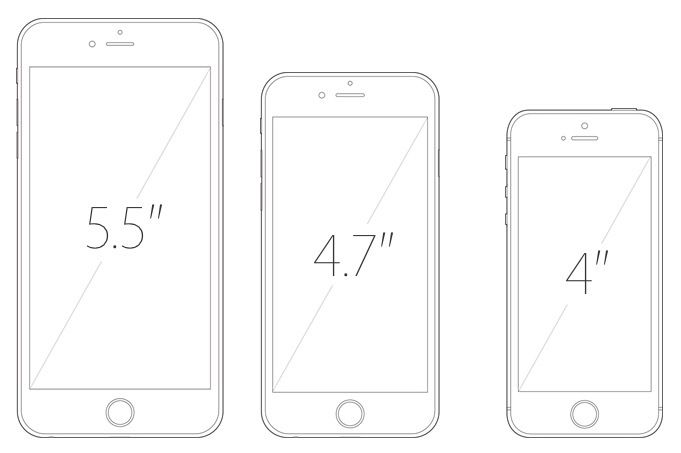 Apple gave good reasons for going with the 3.5" and 4" sizes. Those still apply. The multiple ways a mobile phone can be used are good reasons for the new sizes, but the physical size is more important to some than the screen size. Offer all 3 sizes. No, they like big stuff! Now, please give it the same internals as the larger phones, make it thicker if need be. – someone, who is still on a 4S, because in his eyes this was the perfect form factor. I hope this is true... Apple abandoned a lot of people who appreciated the smaller size of their devices. It would be nice if they continued to give them a solution - one that didn't rely on just saying "buy last year's phone" (or a year from now... buy a 2 year old phone). Can you say: "F-R-A-G-M-E-N-T-A-T-I-O-N" ? Sure, I knew ya could. How would this cause fragmentation? Apple already uses a 4" form factor. If Apple "settles" on three sizes it's a non issue.